Just steps from Marienplatz (Mary’s Square) is St. Peter’s Church, home to one of Munich’s most bizarre relics. 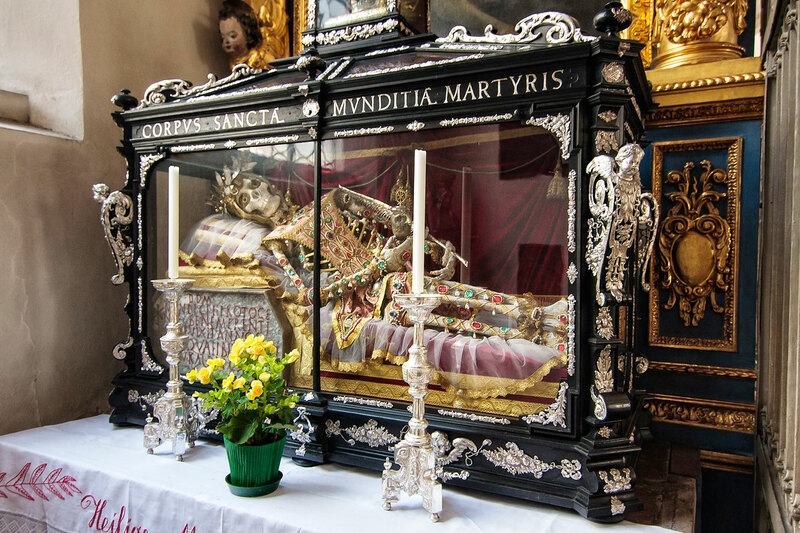 Inside the church on the left-hand side is a glass coffin containing the jeweled skeleton remains of Saint Munditia: the matron saint of matrons (or “spinsters”). 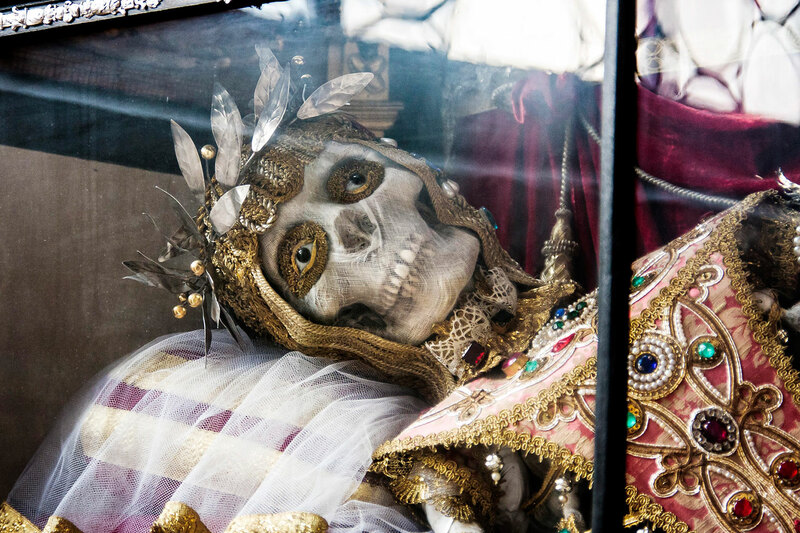 Her remains have been sewn into a transparent body stocking covered in gold and jewels, complete with unblinking glass eyes that stare eternally into the distance. Literally the matron saint of “All the Single Ladies”. They liked her so they put a ring on her. The skeleton is in repose, propped up slightly on cushions for optimal viewing. Her bony hands grasp two items: a palm frond in her left, which is emblematic of her martyrdom; and a goblet in her right, which some claim contains dried blood. A glass ossuary above Saint Munditia’s glass enclosure contains another relic: the skull of Saint Erasmus. Not much is known about Saint Munditia. She was believed to have been martyred in 310, beheaded with an axe. Her remains were discovered in Roman catacombs and transferred to Munich in 1675. Her skeleton was concealed in a wooden shrine from 1804 until 1883, when she was uncovered placed on display in all of her gilded glory. Saint Munditia is celebrated each year with a High Mass. She even has a following on Facebook, if you’re interested. While you’re in the area checking out richly adorned corpses, you might as well spend some time wandering around St. Peter’s Church. St. Peter’s, or “Alter Peter” (Old Peter), is Munich’s oldest parish church, dating from before the city’s founding in 1158. The interior of the church is decorated by gilded Baroque accents and a dominating high alter dedicated to the figure of Saint Peter. 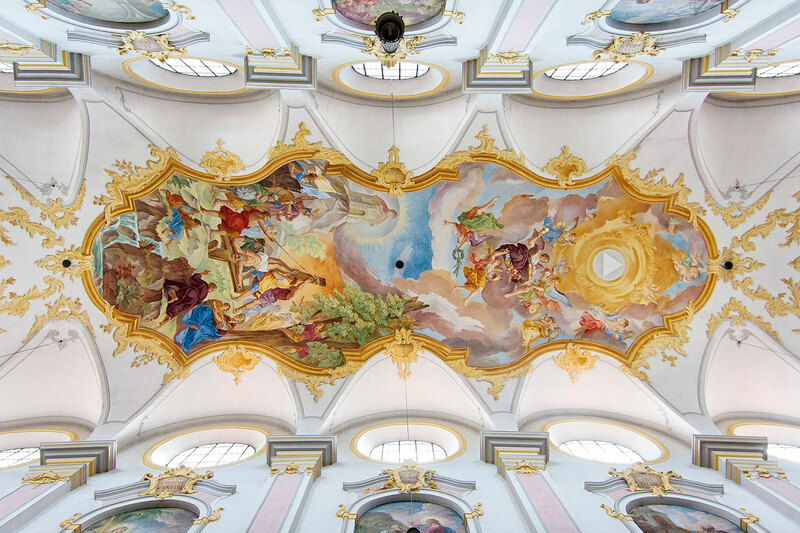 The church also contains gothic paintings by German artist Jan Polack, as well as a series of frescos painted by Johann Baptist Zimmermann. The 91-meter high clock tower of St. Peter’s offers some of the best views of the city. On a clear day, one may be able to see the Alps far in the distance. Admission is €2, after which you climb the 306 narrow stairs that wind through the tower to the top. Be aware that the entrance queue to the tower is not regulated, so depending on your time and day of visit the platform may be crowded. 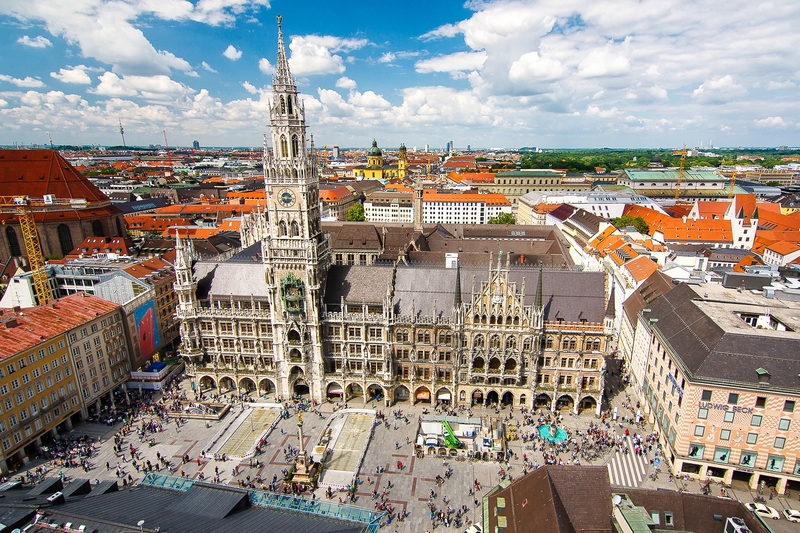 St. Peter’s Church tower affords 360 views of the city, including Marienplatz.